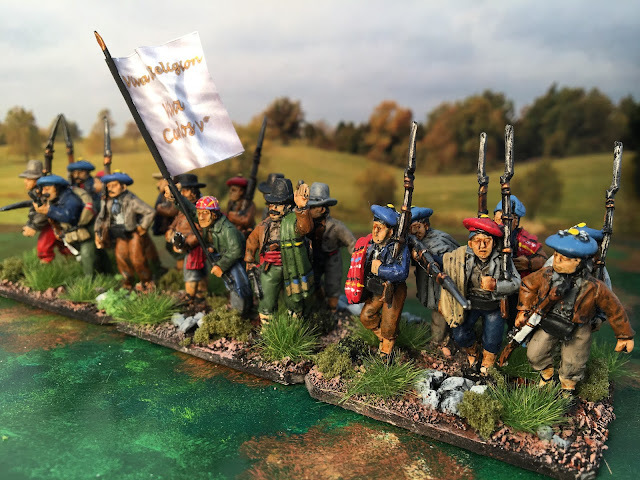 Now that the Crimean War armies are finished – well at least until the Heavy Brigade are released – my focus is returning to two incomplete projects: the First Carlist War and the Russian Napoleonics. 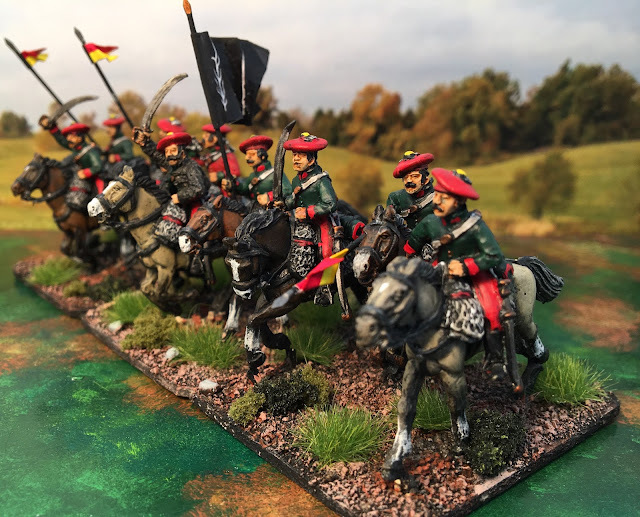 Off the painting table this week are the last of four un-uniformed infantry battalions, a squadron of Navarrese lancers and the set of male civilians, all from the First Carlist War. The look of units on the table has been important to me and ever since the mid 1980’s the look has dominated the way I base figures. 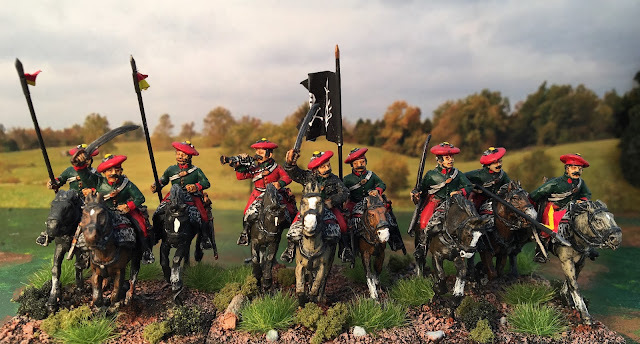 There has been some variation to the way I have organised and based units over that time, but when I started the Wars of the Roses armies, I settled on an organisation that I have applied through the Crimean War and First Carlist War armies. I will probably apply this organisation to all armies going forward. This method uses three stands as the basic unit for infantry and cavalry units and one for two stands for artillery (this latter variant is to reflect that some armies – the Russians in particular – use large batteries). The choice of three stands for the infantry and cavalry means that when the units are formed in line, the command stand will stand in the centre flanked by line stands – and they look right. The War of the Roses armies had a base measuring 60mm wide and 40mm deep and this suited the irregular nature of the WotR armies. 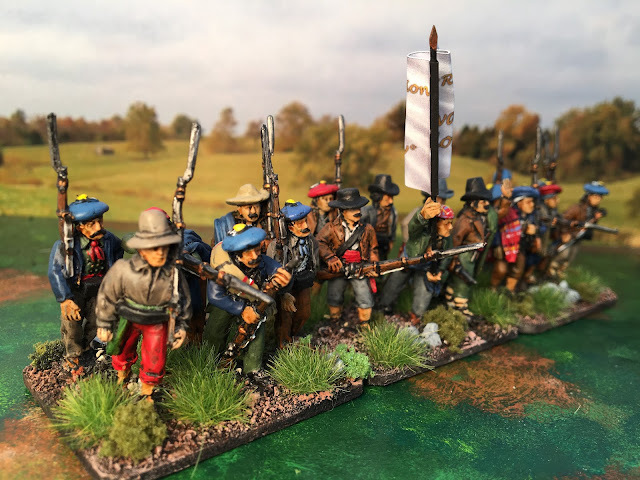 For the Crimeans and the Carlists, however, the figures were just a little too spaced for my liking so the width was set at 50mm for all arms with a depth of 40mm for the infantry, 60mm for the cavalry and as required for the artillery. I did make an exception for the Russian Crimean War infantry, making their base 35mm wide by 50 deep. This was purely to allow the Russian infantry to form in a narrower but deeper column formation for which they were well known. The number of infantry figures on a stand is six and this is for two reasons: first is that it looks right and second (and by no means a minor consideration) the Great War and Perry infantry are sold in packs of six, so that there are no odd left over figures when building units. The number of figures on cavalry bases does vary a bit and this was mainly a matter of economy. 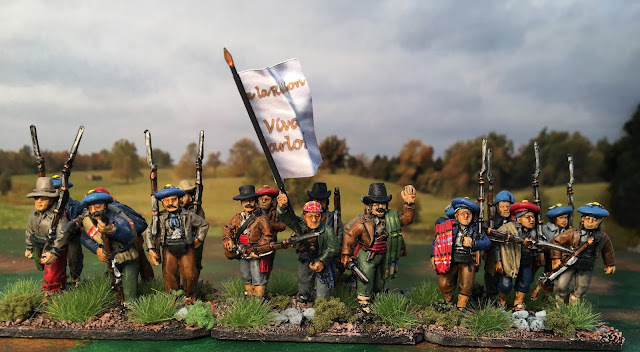 To save a bit of cash I only used two figure on a stand for the Crimean units, but left it at three for the Carlist (Foundry pack cost £12, Great War cost £10 for three figures whereas Perry’s cost £8.50). 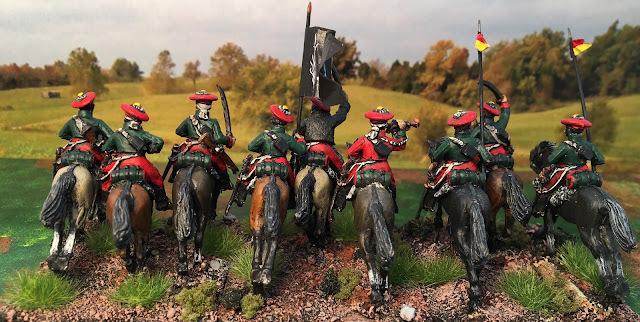 While I did save some £145 by taking this option with the Crimeans, I wish that I had though “to Hell with the cost” and left the Crimean units at three figures per stand, because with the two figures the units look a little light, while the Carlist units look solid and menacing. I have to say that I have been mightily impressed with the service I have had from the Perrys with the Carlist War orders. Every order I have placed in the last few months has been processed and shipped within a day and the longest transit had been seven days – not bad when you consider that this parcel has to be collected from the posting point, sorted at a depot, transferred to an international mail sorting facility, pass through to one or more airline cargo handler, spend at least 30 hours on an aircraft (longer if it comes through the Asia) to cover the 13,000 km between the UK and here, be screened by customs, transfer to a central distribution centre, sent to a local distribution centre and finally delivered to my doorstep (taking into account that suburban mail deliveries in New Zealand are only every second day now). 1 x squadron British Auxiliary Legion cavalry – not yet ordered. My experience with ordering from Perry has been the same as yours. Fast service every time. For large orders, we have received discounts too. Have you asked about that? Thanks Jonahtah. This is indeed a colourful project and coming after the drabness of the Russian Crimean War army is a very welcome change. I have not sought a discount from the Perrys because I tend to keep my orders to a level where I only order what I can paint - although I must admit that at present I have a few more than that on hand at present. The other thing that I do like about the Perrys is that they do not charge VAT on foreign orders (as is correct since exported goods are exempt VAT) and this amounts to a 20% discount. I was commenting just the other day to a friend that when I bought my first metal figures, way back in 1978, it took three weeks for a shipment to arrive, from posting the letter to receiving the parcel. Yet here we are with instant communications and a parcel from one supplier recently took nearly seven weeks to arrive - and less than a week of that was actual time in the post. Thanks Roger. 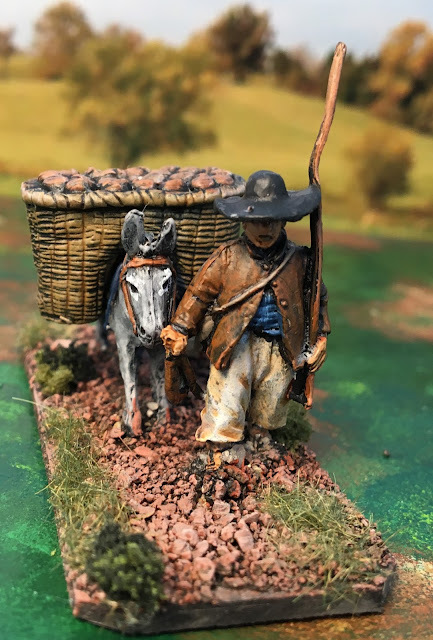 Keep an eye out here in three or four weeks time when the whole collection of Crimean War troops, plus those of a couple of other players, will be used in a significant game - one thet has been in the planning for a year or so. 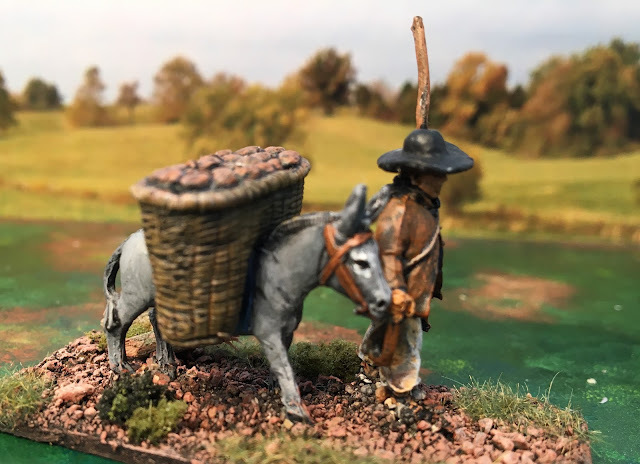 I have been involved in historical wargaming since 1972, co-founding the Auckland Wargaming Club in 1974 and was for 15 years involved in the "industry" in a business that eventually became Battlefront Miniatures. 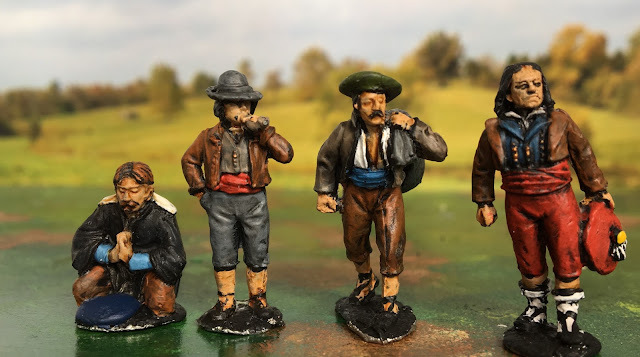 My main focus is on the mid-19th Century and I now collect in only two scales: 28mm for all land based gaming and 1:600 for mid-19th century naval gaming. My philosophy for gaming is: - Play games with people whose company I enjoy - The game must be true to the period - The games must be visually attractive – both the armies and terrain - The end result doesn’t matter - games must be fun.